Optogenetics is the use of genetically coded, light-gated ion channels or pumps (opsins) for millisecond resolution control of neural activity. By targeting opsin expression to specific cell types and neuronal pathways, optogenetics can expand our understanding of the neural basis of normal and pathological behavior. To maximize the potential of optogenetics to study human cognition and behavior, optogenetics should be applied to the study of nonhuman primates (NHPs). The homology between NHPs and humans makes these animals the best experimental model for understanding human brain function and dysfunction. Moreover, for genetic tools to have translational promise, their use must be demonstrated effectively in large, wild-type animals such as Rhesus macaques. Here, we review recent advances in primate optogenetics. We highlight the technical hurdles that have been cleared, challenges that remain, and summarize how optogenetic experiments are expanding our understanding of primate brain function. Cognitive, motor, and sensory functions of the brain depend on coordinated interactions between connected neurons and networks. Abnormal activity patterns in functional brain networks are thought to underlie dysfunction in many brain diseases ranging from Parkinson's disease to schizophrenia. Optogenetics, the use of genetically coded, light-driven ion channels and pumps (opsins) to excite or inhibit neurons, enables fast and focused in vivo manipulation of neural activity. Optogenetic techniques have rapidly become the standard tool used to understand how cell types, circuits, and systems operate in normal and pathological states (Deisseroth, 2015). Recent breakthroughs using optogenetics have confirmed that phasic dopamine responses are teaching signals (Steinberg et al., 2013; Sharpe et al., 2017), shown that amygdala ensembles code for rewarding and aversive stimuli (Gore et al., 2015), and demonstrated that different cortical interneurons have distinct behavioral roles (Kvitsiani et al., 2013). Therefore, optogenetics is a valuable tool kit for investigating the link between brain and behavior. However, optogenetic experiments have been largely restricted to small animal models and the numerous differences between rodent and primate brains limit the generality of insights gained from these experiments. The anatomical, physiological, genetic, and behavioral characteristics of nonhuman primates (NHPs) are closer to the human than any other experimentally accessible species. These homologies make NHPs the best animal model for human brain functions and disorders (Phillips et al., 2014; Roelfsema and Treue, 2014). Applying optogenetics to study cell type-, circuit-, and system-level questions in NHPs promises to reveal fundamental mechanistic insights for human brain function and dysfunction. The first NHP optogenetic studies used optical stimulation to activate neurons in primary motor cortex (M1) or frontal eye field (FEF) (Han et al., 2009; Diester et al., 2011). Subsequent studies provided evidence that optogenetics can be used to manipulate NHP behavior (Cavanaugh et al., 2012; Gerits et al., 2012; Jazayeri et al., 2012; Ohayon et al., 2013). Therefore, optogenetics was shown to modulate neuronal activity and behavior in NHPs. Since then, studies have started to provide new insights about function and dysfunction of specific brain circuits (Afraz et al., 2015; Inoue et al., 2015; Lu et al., 2015; Nassi et al., 2015b; Acker et al., 2016; Galvan et al., 2016; Klein et al., 2016; Stauffer et al., 2016; El-Shamayleh et al., 2017; Tamura et al., 2017). Despite these significant advances, the pace of NHP optogenetic studies is slowed by the current demand for tool development, modification, and improvement. Genetic engineering is commonly used to achieve cell type- and pathway-specific optogenetics in transgenic mice (Gong et al., 2007). Transgenic NHPs are not widely available (Izpisua Belmonte et al., 2015), so viral vector delivery is the method of choice to deliver opsins to NHPs. However, current technology has a limited ability to direct cell type specificity. The anatomical and genetic differences between rodents and NHPs mean that the strategies used in rodent optogenetics are not always effective in NHPs. For example, given the larger size of macaque brains, the volume of tissue that should be engaged in optogenetic modulation is far greater. Research in NHPs benefits from using the same animal for multiple experiments, for example, in the context of assessing neuronal plasticity and the effects of learning. Therefore, reducing brain tissue damage inflicted by probe penetrations, viral injections, and light-induced heating is a priority. Currently, postmortem inspection is typically used to verify opsin expression, but in vivo assessment of expression levels would enhance the effectiveness of optogenetic manipulations in longer-lasting NHP experiments. Addressing these challenges will advance primate neuroscience and hasten translation to medicine. Optogenetic techniques have the potential to be used in prosthetic devices or as an alternative to deep-brain stimulation (Busskamp et al., 2012; Chow and Boyden, 2013; Williams and Denison, 2013; Wykes et al., 2016). To maximize this translational potential, optogenetics should be broadly applicable in large, wild-type animals such as NHPs. Here, we review recent breakthroughs in NHP optogenetics from our research groups (Fig. 1) and use these reports and others to demonstrate how some obstacles have been surpassed to give way to new scientific insights. Accordingly, this review is intended to provide a broad overview of the current state of the art. Readers are referred to more specialized publications about viral vector strategy (Gerits et al., 2015; El-Shamayleh et al., 2016; Mendoza et al., 2017), behavioral modulation (Kinoshita and Isa, 2015), and the use of NHPs (Galvan et al., 2017). The techniques currently used to gain genetic access to specific cell types, to deliver sufficient viral vector loads and light intensities, and to minimize tissue damage will lead the way toward safe, effective, and widespread use of optogenetics in NHP-based neuroscience research. In addition, these techniques can serve as a foundation for future circuit-based therapy options. Recent advances in NHP optogenetics. Shown is a schematic outline of the macaque brain indicating the regions and pathways that are the focus of recent studies that use optogenetics. Colored ovals represent different brain nuclei and arrows represent connections between areas. M1, Primary motor cortex; FEF, Frontal eye field; LGN, lateral geniculate nucleus; SC, superior colliculus; MThal, Motor thalamus; SNc/VTA, substantia nigra pars compacta/ventral tegmental area; OMV, oculomotor vermis. 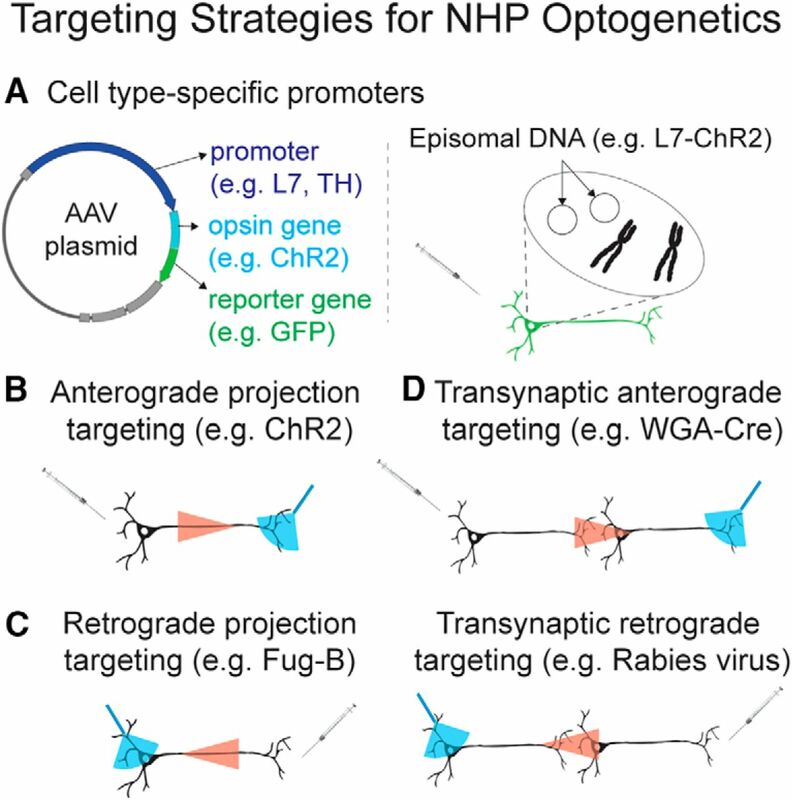 A significant roadblock to effective NHP optogenetics is the lack of universal tools such as genetically modified Cre-driver lines (Gong et al., 2007) for selective targeting of neuronal populations in NHPs. Efforts to circumvent this roadblock and achieve selective neuronal manipulations in monkeys can be broadly classified into two approaches: (1) those that use cell type specific gene promoters (Fig. 2A) and (2) those that use projection targeting. (Fig. 2B–D). Both approaches are based on the use of viral vectors to deliver opsin genes to neurons. In particular, adeno-associated virus (AAV) and lentivirus (LV) are commonly used because they are relatively safe and because they can infect nondividing cells such as neurons (Lentz et al., 2012; Kotterman et al., 2015). Methods to achieve selective optogenetic control of specific neuronal populations. A, Cell type specific-promoters. Left, Example AAV plasmid (but LVs were used as well). Dark blue, cyan, and green regions represent the normal positions of the promoter, opsin gene, and reporter gene, respectively. Gray regions of the plasmid represent standard AAV plasmid components and posttranslational enhancers. For more information, the reader is referred to https://www.addgene.org/viral-vectors/aav/aav-guide/. Right, AAVs injected into the brain region of interest infect cells nearby and the recombinant DNA normally remains episomal as circular DNA. Transcription of the recombinant DNA and subsequent opsin expression proceeds only in cells where the promoter is actively used (e.g., the L7 promoter in cerebellar Purkinje cells), allowing for a cell type specific optogenetic manipulation. B, Anterograde projection targeting. The viral vector, normally carrying a ubiquitous promoter (e.g., CMV), is injected into a particular brain region. As the opsin is expressed, it will be trafficked to the cell axons. The viral vector will infect cells in the injected region, but light is only delivered at a distant projection zone of some cell bodies at the injection site. Therefore, only the cells that project from the injected site to the illuminated region are activated. C, Retrograde projection targeting. Specialized viral vectors that are trafficked in the retrograde direction (e.g., rAAV2-retro, Fug-B) are injected in a brain region. The vector particles that enter axon terminals are transported back to the cell bodies, where transcription of the recombinant DNA occurs. Light is delivered to the cell bodies that project to the injected site. Therefore, only the cells that project from the illuminated region to the injected regions are activated. D, Transsynaptic projection targeting. Specialized proteins (e.g., WGA-Cre) and viruses (e.g., rabies, HSV) cross the synaptic cleft. Synaptic crossing occurs in the anterograde (top) or retrograde (bottom) direction, depending on the protein/virus used. Red arrows in B–D indicate the direction of transport. The principal drawbacks to AAV and LV are their limited genetic capacities, ∼5 and ∼9 kb, respectively (Lentz et al., 2012). These limits require concise genetic sequences to control opsin expression. One approach is to isolate or synthesize small promoters. Several general purpose promoters are commonly used, including CMV and Ef1α, but viruses containing these promoters transduce a variety of cell types including neurons and glia (Yizhar et al., 2011). Early breakthroughs have achieved cell type selectivity using viral vectors that carry small promoter sequences. The CaMKIIα promoter has been often used in NHP experiments to target excitatory neurons (Han et al., 2009; Dai et al., 2014; Lu et al., 2015; Nassi et al., 2015a). Targeting NHP inhibitory interneurons is now within reach due to the development of mDlx enhancer elements (Dimidschstein et al., 2016). 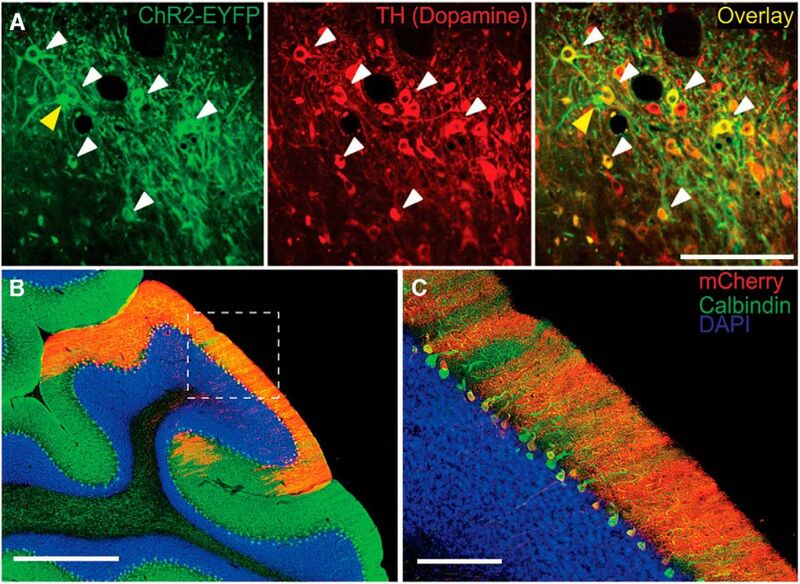 The tyrosine hydroxylase (TH) promoter has been used to label NHP dopamine neurons with GFP (Lerchner et al., 2014). Likewise, a promoter was developed to target D2-expressing medium spiny neurons in wild-type rodents (Zalocusky et al., 2016). These studies and others provide evidence that promoters can be used to direct cell type specific gene expression. Three recent NHP studies have used cell type specific promoters to enable optogenetic investigation of well defined neuronal types and their role in brain function and behavior. These successes augur well for promoter-based targeting of specific cell types in the primate CNS. The CaMKIIα promoter was used in macaque monkeys to target the well established projection from the lateral geniculate nucleus (LGN) to primary visual cortex (V1) (Klein et al., 2016). The laminar organization of primate LGN gives rise to three cell type-specific projection streams to V1, originating in konio-, magno-, and parvo-cellular neurons. Konio cells express the α subunit of the protein CaMKII (Hendry and Yoshioka, 1994), whereas the magno- and parvo-cellular neurons express parvalbumin (Yan et al., 1996). LGN konio neurons were successfully targeted using an AAV5-CaMKIIα-ChR2-eYFP vector injected into the LGN of macaque monkeys. A significant number of cells were eYFP positive and the majority of these cells were CaMKIIα-expressing neurons. However, there was also evidence for sparse labeling of other neuron types and of cells located outside of LGN, for example, in the retina or in V1, as a result of retrograde transport of vector particles to the distant cell bodies of neurons projecting to the injection site in LGN. Moreover, visual stimulation revealed that many of the optogenetically identified konio cells were not visually responsive. This result, in accordance with previous findings (Norton and Casagrande, 1982), suggested that other extraretinal signals could contribute to konio cell responses. Optogenetic stimulation of konio cell bodies in LGN evoked neuronal activity in V1. The resulting V1 laminar activation pattern was consistent with previous anatomical studies demonstrating the koniocellular projection to V1's supragranular layers (Norton and Casagrande, 1982; Hendry and Yoshioka, 1994; Chatterjee and Callaway, 2003). The TH promoter is active in dopamine neurons, where the gene product TH is a key enzyme catalyzing the synthesis of dopamine. To target dopamine neurons in Rhesus monkeys, a viral vector delivered the gene for the enzyme Cre recombinase under the control of a 300 bp TH promoter fragment. A second viral vector containing a double-floxed insert consisting of the gene for ChR2 driven by the ubiquitous Ef1α promoter was injected with the TH-Cre virus (Stauffer et al., 2016). This strategy separated the demands of cell type specificity (determined by the small TH promoter) from the demand for high levels of ChR2 expression (determined by the Ef1α promoter) and resulted in ChR2 expression in ∼40% of dopamine neurons. More importantly, the strategy produced highly specific expression; >95% of ChR2-expressing neurons were dopaminergic (Fig. 3A). Cell type specific promoters direct expression of opsins in dopaminergic neurons and Purkinje cells in macaques. A, Expression of ChR2-EYFP (left) and TH (indicating dopaminergic neurons; middle). The majority of ChR2-EYFP-positive cells are also TH-positive, as indicated by white arrows. Yellow arrow indicates a rare example of nonspecific labeling. B, Expression of ChR2-mCherry (red) is restricted to calbindin-positive (green) neurons. Calbindin is a reliable marker of cerebellar Purkinje cells. The region within the white square is shown at a higher magnification in C. Scale bars: A, 0.1 mm; B, 1 mm; C, 0.2 mm. Reproduced with permission from Stauffer et al. (2016) (A) and El-Shamayleh et al. (2017) (B, C). Optical stimulation was paired with liquid rewards to modulate reward value. Dopamine neurons responded more strongly to cues that predicted dopamine neuron-specific optogenetic stimulation at the time of the reward compared with cues that predicted reward alone (Fig. 4A). Larger dopamine responses reflect greater value, suggesting that the animal should choose the option that predicted stimulation (Lak et al., 2014; Stauffer et al., 2014). Indeed, animals readily learned which cue was associated with optogenetic reward stimulation and chose it with greater frequency (Fig. 4B). Therefore, dopamine neuron-specific optogenetic stimulation resulted in neuronal and behavioral correlates of value learning. Neuronal and behavioral correlates of optical stimulation applied to specific neuronal populations. A, B, Neuronal and behavioral correlates of stimulating dopamine neurons. A, Inset, Blue visual cue predicted liquid reward along with laser stimulation, whereas the red visual cue predicted the delivery of reward alone. Peristimulus time histogram (PSTH; top) and raster plot (bottom) demonstrate that dopamine neurons responded more strongly to the cue that predicted reward with laser stimulation (blue) compared with cues that predicted reward alone (red). B, Probability of choosing the option associated with reward and optical stimulation. Animals chose between a cue that predicted reward with optical stimulation and a cue that predicted reward alone. Blue data (× and line) from one session with optical fiber in the injected hemisphere. Red data (× and line) from one session with optical fiber placed in the noninjected, control hemisphere. × indicates choices for the option associated with optical stimulation (top) or option associated with reward alone (bottom). Lines represent moving averages (sliding window with 10 steps) of the two choice sets. C, D, Neuronal and behavioral correlates of FEF to SC pathway stimulation. C, PSTH of SC neuronal responses to FEF axon terminal stimulation separated according to whether a saccade was evoked (filled, red histogram) or not evoked (black line). 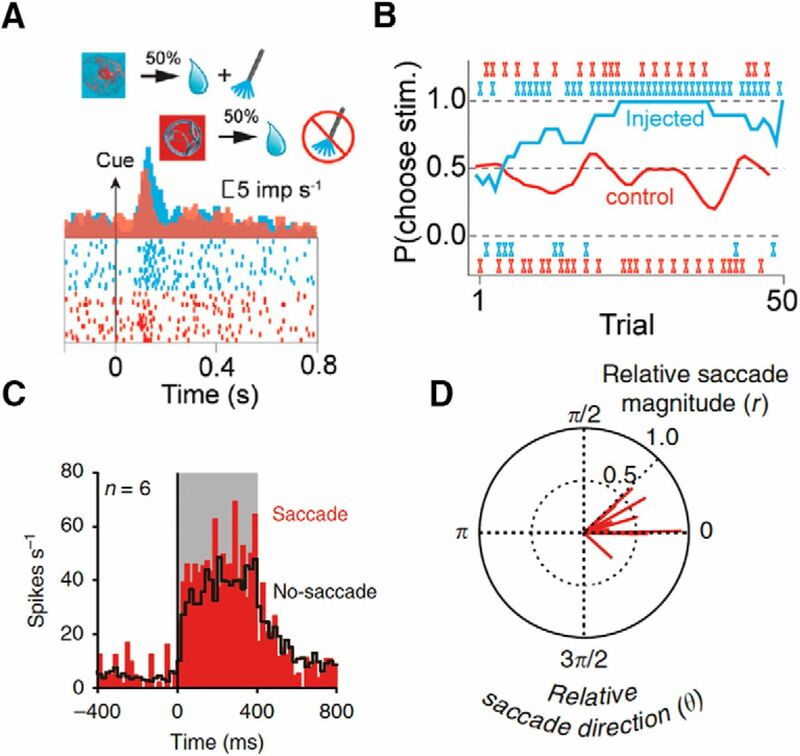 SC neurons responded more strongly after stimulation events that evoked a saccade compared with stimulations that did not evoke a saccade. D, Polar plot of the magnitude (r) and direction (θ) of optogenetically evoked saccades. Red lines indicate the averaged vector of evoked saccades at each stimulation site (n = 15). Saccade toward center of response field is represented by r = 1.0, θ = 0. Reproduced with permission from Stauffer et al. (2016) (A, B) and Inoue et al. (2015) (C, D). The L7 gene and its promoter provide a compelling example of differential gene regulation across neuronal types and how this genetic foundation can be leveraged for cell type specific targeting in primates. Within the cerebellum, the L7 gene is active only in Purkinje cells and is silent in other cell types (Nordquist et al., 1988; Oberdick et al., 1988). The induction of L7 protein expression is coincident with the morphological structuring of Purkinje cell dendrites and synaptogenesis (Oberdick et al., 1988; Zhang et al., 2002). The L7 promoter is the basis for several lines of Purkinje cell-specific transgenic mice (Oberdick et al., 1988; Sługocka et al., 2017), but the earliest promoter sequence used to generate these animals was 8 kb long and thus too large to be used in AAV or LV vectors. Fortunately, subsequent systematic truncations of the full promoter sequence revealed that the minimal gene regulatory sequence required for Purkinje cell targeting (∼1 kb) is small enough to fit in these viral vectors (Oberdick et al., 1993). One study used a murine L7 promoter sequence in AAV vectors (AAV1 and AAV9) to express ChR2 and achieve selective optogenetic control of Purkinje cells in Rhesus macaques (El-Shamayleh et al., 2017). Immunohistochemical analyses revealed strong, Purkinje cell-specific ChR2 expression (91–96% selective; Fig. 3B). To assess whether ChR2 expression driven by the L7 promoter could perturb primate Purkinje cell function in vivo, the effects of optical stimulation in cerebellar cortex were assessed electrophysiologically and behaviorally. Extracellular recordings at cerebellar cortical sites transduced with AAV-L7-ChR2 vectors demonstrated robust optogenetic activation, with spiking responses that entrained to sinusoidal laser modulation frequencies of up to 20 Hz. Optical stimulation of the oculomotor vermis, a cerebellar cortical region involved in the execution of accurate saccades, caused consistent saccade dysmetria with a latency of ∼15 ms. These results demonstrate the utility of AAV-L7-ChR2 vectors for investigating Purkinje cell-specific contributions to circuit function and behavior in primates. These new studies collectively highlight the possibility of using cell type specific promoters to achieve opsin expression in targeted NHP neuronal populations and to manipulate NHP behavior with these selective perturbations of neuronal activity. The discovery and development of new and enhanced promoters will enable optogenetic manipulation in anatomically and behaviorally relevant neuronal populations of monkeys to approach the effectiveness of optogenetic manipulation in small, transgenic animals. One critical advantage of optogenetics is the ability to perturb selectively the activity of neural pathways that connect two brain regions. Moreover, where cell type specific promoters are not available, projection targeting approaches can be used to gain cell type specificity. Pathway-selective optogenetic stimulation can be accomplished via anterograde, retrograde, or transsynaptic transport mechanisms (Fig. 2B–D) (Gradinaru et al., 2010; Stuber et al., 2011; Tye et al., 2011; Warden et al., 2012; El-Shamayleh et al., 2016). Anterograde projection targeting, in which opsins expressed at axonal terminals are activated locally, has been used to elucidate neural network functions in the primate brain (Inoue et al., 2015; Galvan et al., 2016). To manipulate selectively the projection from the FEF to the superior colliculus (SC), an AAV-CMV-ChR2 vector was injected into the FEF and a fiber optic was inserted into the SC to illuminate ChR2-expressing axon terminals of FEF neurons (Inoue et al., 2015). Many SC neurons were excited by optical stimulation of FEF axon terminals. Optical stimulation of axon terminals often evoked saccadic eye movements toward response fields corresponding to the stimulation sites in the SC (Fig. 4C,D; Inoue et al., 2015). This result was in contrast to activation of cell bodies in the FEF, where optical stimulation decreased reaction time but rarely evoked saccades unless paired with electrical stimulation (Gerits et al., 2012; Ohayon et al., 2013). This suggests that the cell selectivity achieved via projection targeting can result in strong behavioral effects. Pathway-selective stimulation after anterograde transport of opsins has also been used to study corticothalamic motor circuits in NHPs. AAV-CaMKIIα-ChR2 or AAV-CaMKIIα-C1V1 was injected into the motor cortices. Optogenetic activation of corticothalamic terminals modulated activity in ventral motor thalamus neurons (Galvan et al., 2016). 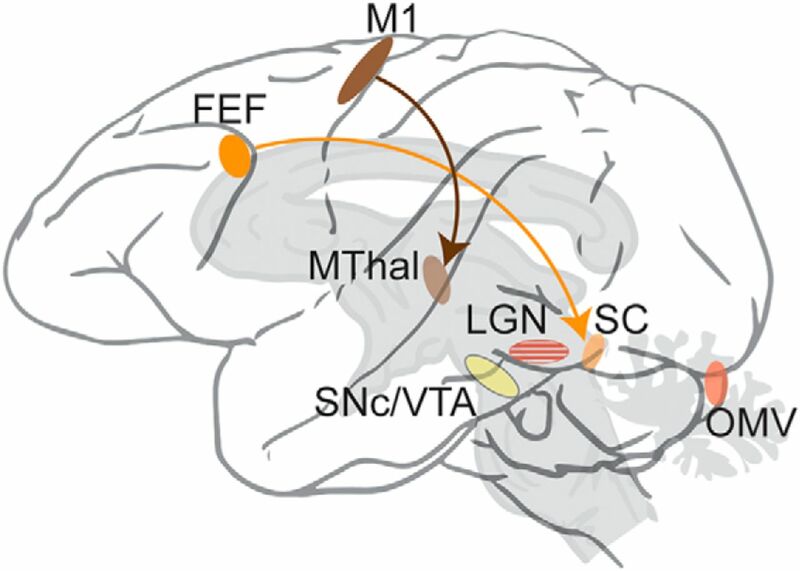 In contrast to the shorter latency excitations described in the oculomotor pathway (Inoue et al., 2015), selective optogenetic activation of corticothalamic terminals resulted in long-latency and complex physiological responses of motor thalamic neurons, suggesting a modulatory role for cortical afferents in the primate motor thalamus. Retrograde transport capabilities can be used to achieve cell type and pathway-selective optogenetic control (Kato et al., 2011; Oyibo et al., 2014; Tervo et al., 2016; Tanabe et al., 2017). In these cases, viral particles enter axon terminals at the injection site and are then transported along the axon back to the cell body, where the transgene will be transcribed. Efforts are currently ongoing to test the efficacy of several varieties of retrograde viruses in NHPs, including LVs with modified glycoproteins such as Fug-B, Fug-B2, Fug-E, and Tloop (Kato et al., 2011; Hirano et al., 2013; Cetin and Callaway, 2014; Kobayashi et al., 2016; Tanabe et al., 2017), herpes simplex virus (Neve et al., 2005; Fenno et al., 2014), canine adeno virus type 2 (Soudais et al., 2001; Salinas et al., 2009; Junyent and Kremer, 2015), AAV serotypes with endogenous retrograde properties (Rothermel et al., 2013), and designer AAVs with engineered retrograde capabilities (Tervo et al., 2016). One study showed that an optimized chimeric envelope glycoprotein (FuG-E) greatly accentuates the efficacy of retrograde gene delivery of a pseudotyped LV vector in the primate brain. Striatal injection of the FuG-E-GFP vector-labeled neurons in regions that project to the striatum, including cerebral cortex, thalamus, and substantia nigra (Tanabe et al., 2017). Transsynaptic transport of viral particles or gene products holds the promise to create widespread yet circuit-specific labeling to investigate large-scale brain networks. In this case, the viral particles or gene products will travel anterogradely to the axon terminals or retrogradely to the soma, where they will cross the synapse to be incorporated into connected neurons (Gradinaru et al., 2010; Nassi et al., 2015a). An important consideration is that the retrograde spread may extend beyond one synapse. The potential benefit is that using a transsynaptic vector will provide optogenetic control over multisynaptic circuits, but the peril is that some commonly used transsynaptic viruses are cytotoxic (Nassi et al., 2015a). In rodents, some AAV serotypes (AAV1 and AAV9) show anterograde transsynaptic transduction properties (Zingg et al., 2017) that can be exploited along with Cre-dependent expression to identify and modulate specific neuronal pathways. Further engineering of transsynaptic vectors to reduce toxicity and enhance transgene expression (Nassi and Callaway, 2007; Oyibo et al., 2014) will broaden their use in NHP optogenetic experiments. Using novel viral vectors to achieve selective opsin expression based on synaptic connectivity would be particularly advantageous for studying large-scale brain networks in NHPs. Rhesus macaque brains are 200 times larger than mouse brains and contain two orders of magnitude more neurons (Herculano-Houzel, 2009). Therefore, a larger number of neurons should be engaged for optogenetic modulation of NHP behavior compared with rodent experiments. To achieve this, NHP optogenetic studies require opsin expression across large brain areas, opsins with enhanced light sensitivity, and broad light delivery. High levels of opsin expression across large brain areas can be achieved by using enhanced viral vector delivery techniques and selecting viral vector types that diffuse easily through brain tissue. MRI guidance and convection enhanced infusion have been applied successfully to deliver large volumes of viral vectors to precise locations in the NHP brain (Bankiewicz et al., 2000; Yazdan-Shahmorad et al., 2016). Similarly, LV and AAV viral vector subtypes can be selected to maximize the spread of the viral solution and transduction of neurons (Gerits et al., 2015; El-Shamayleh et al., 2016). Light is absorbed as it propagates in the brain. Oxygenated hemoglobin is the major source of visible light absorption in living brain tissue and red light is the least absorbed visible wavelength spectrum (Eggert and Blazek, 1987; Robles et al., 2010). In vivo measurements from rodent cortex at a depth of 1.5 mm showed that five times as much red light remained unabsorbed compared with green or blue light (Acker et al., 2016). Therefore, next generation opsins that are activated preferentially by wavelengths closer to the red spectrum, including VChR1 (Zhang et al., 2008), C1V1 (Yizhar et al., 2011), Jaws (Chuong et al., 2014), Chrimson (Klapoetke et al., 2014), ReaChR (Lin et al., 2013), and BReaChES (Rajasethupathy et al., 2015), show promise for large-volume tissue modulation in primates. C1V1 stimulation of principal neurons in somatosensory cortex in macaques is sufficient to elicit a sensation (May et al., 2014), a finding that could be exploited to mimic sensory stimulation when sensory functions have been compromised (e.g., in the development of neuroprostheses for stroke or spinal cord injury). Research with C1V1 opsins, along with multielectrode arrays, revealed spatiotemporal dynamics in the monkey motor cortical networks (Lu et al., 2015). Likewise, C1V1 opsins have been used to test the computational properties of V1 neurons (Nassi et al., 2015b) and to demonstrate that optogenetic activation of the lateral intraparietal area can bias eye movements during a visuospatial discrimination task (Dai et al., 2014). Light must be delivered more broadly in primates than in rodents to affect functionally relevant neuronal populations. Indeed, some of the early failures to observe behavioral effects of optogenetic stimulation in FEF (Han et al., 2009) have been overcome by improving light delivery (Gerits et al., 2012; Acker et al., 2016). Strategies to increase the extent of brain tissue illuminated include the use of probes that combine multiple fibers (Tamura et al., 2012) or optic fibers with a tapered end (Dai et al., 2015; Acker et al., 2016, 2017). In one study, an improved optrode combined with the red-shifted inactivating opsin Jaws inhibited >90% of macaque FEF neurons over a 10 mm3 tissue volume (Acker et al., 2016). This result is comparable to the volumes inactivated in cortical cooling (Chafee and Goldman-Rakic, 2000) and pharmacological inactivation studies (Sommer and Tehovnik, 1997; Tehovnik and Sommer, 1997; Martin and Ghez, 1999). The optogenetic inactivation was effective at low light intensities and resulted in large behavioral changes (Acker et al., 2016). Therefore, the use of enhanced light delivery and red-shifted opsins to perturb large populations of neurons renders optogenetic manipulations more effective at modulating NHP behavior. In optogenetic experiments, tissue can be damaged by light-induced heating and repeated probe insertion. Limiting excessive tissue heating is essential because cortical temperature increases of >4°C may induce damage. Moreover, temperature increases could result in unwanted side effects such as neuronal firing increases in some heat-sensitive brain areas in response to >2°C temperature increases (Kiyatkin and Brown, 2004; Kiyatkin, 2004; Kiyatkin, 2005, 2007). Illumination-induced heterogeneous neuronal firing patterns can be effectively eliminated by monitoring tissue heating and limiting light power to avoid a >1°C temperature increase (Acker et al., 2016). Although experiments in superficial cortical regions can be performed through optical windows using noninvasive light sources (Ruiz et al., 2013; Yazdan-Shahmorad et al., 2016), studies of deep cortical layers or subcortical structures require repeated probe insertion, with consequent tissue damage. There is a tradeoff between fiber outer diameter and tissue damage. Thicker fibers deliver more light but increase tissue damage induced by probe insertion, especially in acute experiments. Furthermore, when combined recordings and stimulation are desired, the traditional approach of using optrodes fabricated by gluing a fiber to an electrode might induce greater damage because these probes are prone to shearing and cutting brain tissue. There has been steady progress in developing multishank and coaxial probes (Abaya et al., 2012; Wang et al., 2012; Chen et al., 2013; Ozden et al., 2013; Lee et al., 2015; Naughton et al., 2016) that minimizes these problems. The use of tapered-end fibers results in reduced brain damage compared with optical fibers with a blunt end (Dai et al., 2015; Acker et al., 2016, 2017; Pisanello et al., 2017; Tamura et al., 2017). An alternative to the repeated optrode penetrations is the use of chronically implanted multielectrode arrays that incorporate an optic fiber for opsin activation (Lu et al., 2015), or micro-electrocorticographic laminar arrays for cortical surface recordings (Yazdan-Shahmorad et al., 2016). Looking toward translational approaches may further inspire engineering innovations in primate optogenetics. For example, when laser thermal ablation is used to treat otherwise inoperable brain tumors and epileptogenic foci in human patients, repeated penetrations are avoided, if possible, to minimize penetration damage (Missios et al., 2015). Further, in proportion to total brain size, the diameter of optical fibers currently in use for human thermotherapy, ∼600 μm (Norred and Johnson, 2014), is less than that used in NHPs (about 200–400 μm for optrodes). During human surgeries, the temperature of surrounding tissue during laser ablation is monitored to minimize collateral tissue damage (Missios et al., 2015). Based on current laser use in human neurosurgery, reasonable future directions for NHP optogenetics many include temperature monitoring, chronic or semichronic light probes to limit repeated penetrations, and reductions in illuminator/electrode diameter. Currently, most researchers depend on postmortem histological examination to confirm the correct targeting of brain regions or cell types and level of opsin expression. Ideally, a noninvasive in vivo method would monitor opsin expression after virus injections and before starting functional experiments. If the opsins are expressed in neurons inhabiting superficial cortical layers, imaging of the fluorescent reporter can be used to gauge opsin expression through optical windows (Ruiz et al., 2013). For subcortical structures, fluorescence can be detected in vivo using an optic fiber positioned in the injected area (Diester et al., 2011; Tamura et al., 2012; Ozden et al., 2013; Tamura et al., 2017). This method is encumbered by the damage inflected on the tissue by probe insertion, but may be preferable to postmortem verification. As an example, in one study of the role of the perirhinal cortex in behavioral judgements of object semantic value, researchers used a multifiber optogenetic probe that provided improved light delivery, minimized tissue damage, and monitored opsin expression (Tamura et al., 2017). A radically different approach to minimizing tissue damage and assessing transgene expression is to pursue an all-optical interrogation (AOI) strategy (Rickgauer et al., 2014; Emiliani et al., 2015). AOI involves coexpression of an activity reporter gene (e.g., GCaMP) and an actuator (e.g., red-shifted opsin) and the use of a single optical probe to image and perturb activity. AOI has several advantages over traditional electrophysiology. First, a much larger set of neurons can be monitored simultaneously compared with single electrode or even multishank probes. Second, it is possible to identify activity arising from specific neurons reliably. Third, structured illumination patterns can be applied to study local connectivity and dynamics. AOI experiments in rodents have used gradient refractive index (GRIN) lenses (Ghosh et al., 2011; Ziv et al., 2013), but at the cost of significant tissue damage above the region of interest (i.e., brain aspiration; Barretto and Schnitzer, 2012), which may not be acceptable in studies involving NHPs. Furthermore, commonly available GRIN lenses are 2–5 mm in length, not long enough to reach deep subcortical regions in NHPs. A recent study tested a new microendoscope design consisting of ultrathin multimode optical fibers that are 5–10 times thinner than commercially available GRIN lenses and have no length constraint (Ohayon et al., 2017). These fibers are of the same type as those traditionally used in NHP optogenetic experiments (Diester et al., 2011) and fiber photometry (Gunaydin et al., 2014; Kim et al., 2016). However, in contrast to fiber photometry, this new design allows for full image reconstruction beneath the fiber down to a micron-scale resolution. Furthermore, it allows the delivery of light patterns (structured light) at the fiber tip for precise stimulation of only a subset of neurons in the field of view. Ongoing experiments are under way to test this technology in NHPs and make it accessible for end users. Human perception, action, and cognition are largely dependent on specialized brain networks that arose during the evolution of primates. This specialization renders NHPs, especially Old World monkeys such as Rhesus macaques, an invaluable animal model with which to investigate human brain function. Modern neuroscience has been reshaped by game-changing technologies including optogenetics and genetically coded calcium indicators that are most effectively applied to transgenic animals. Although transgenic Rhesus macaques have been created successfully (Yang et al., 2008; Liu et al., 2016), economic considerations and the long generation time may limit the utility of transgenic Old-World monkeys in neuroscientific research. Moreover, the successful implementation of emerging (optogenetic) technologies in wild-type macaques will provide a rich foundation for the translational application of circuit-based therapy to humans. Therefore, developing methods to facilitate the application of genetic techniques for controlling and monitoring neural activity in NHPs is one the most critical challenges in modern neuroscience. Recent studies have achieved effective application of optogenetics to NHPs by demonstrating cell type specific expression using gene promoters, selective projection targeting, improved light delivery, and opsins with improved light sensitivity. As reviewed here, cell type specific promoters have been used to study the function of konio cells in the LGN, dopamine neurons in the midbrain, and Purkinje cells in the cerebellum (Fig. 3). The use of cell type specific promoters brings NHP neuroscience one step closer to the capabilities of transgenic mouse studies. Moving forward, the development or discovery of new regulatory sequences that confer selective expression in a wide array of neuronal types will be one of the greatest challenges that we face. Most genes are expressed in many cell types, rather than being cell type specific. Moreover, it is not clear how conserved noncoding transcriptional regulatory regions are, so it is not clear which mouse promoters will be effective in monkeys (Suzuki et al., 2004). To advance the field, studies in which promoters can be screened or engineered in a high-throughput fashion may hold the key to unlocking a wider array of cell type specific promoters (Portales-Casamar et al., 2010; Schlabach et al., 2010; Rajkumar and Maerkl, 2012; Smith et al., 2013). Projection targeting, which does not rely on cell type specific promoters, but rather relies on anterograde trafficking of opsins or retrograde transport of viral particles (Fig. 2), has already been used to reveal the functional roles of motor control networks (Inoue et al., 2015; Galvan et al., 2016). New viral vectors with selective and improved retrograde transport properties present an opportunity to photo-identify cells that project to a region of interest. This technology will make it feasible to record selectively from afferent neurons and discover how neural circuits process information. Moreover, a likely contributor to the absence of observed behavioral correlates in early optogenetic experiments is coactivation of competing neuronal populations that cancel each other's effect. It may be possible, therefore, to increase the size of observed behavioral effects by increasing cell type selectivity. Indeed, targeting specific neuronal populations, whether via gene promoter or pathway tracing, has resulted in sizable behavioral effects after optical stimulation (Fig. 4) (Inoue et al., 2015; Stauffer et al., 2016; El-Shamayleh et al., 2017). These advances bode well for the future of investigating neural signals and their relationship to well controlled behaviors in NHPs. Traditionally, similar optical probes were used to deliver light in mice and monkeys despite the fact that the monkey brain is two orders of magnitude larger than that of the mouse. By combining light delivery probes that have tapered endings with red-shifted opsins, large volumes of brain tissue (∼10 mm3) can be illuminated by a single probe (Acker et al., 2016, 2017). Moreover, because probes with tapered ends reduce the damage caused by probe insertions, multiple probes can be inserted, maximizing the chance to (in-)activate entire monkey brain regions. In summary, we are substantially closer to optogenetics being applied in NHPs as effectively as it is applied in rodents. Further progress in NHP optogenetic experiments and translation to human medicine will depend on the rapid dissemination of technical advances and setbacks faced in the course of these experiments. Indeed, given the larger expenses and time needed for primate experiments relative to other species, communication of negative or incremental findings in optogenetic (or similar) techniques may be particularly beneficial for the NHP research community. The new developments reviewed here highlight the value of primate optogenetics to reveal the mechanistic insights into the brain circuits that support perception, action, and cognition and how their dysfunction gives rise to human pathologies. This work was supported by the National Institutes of Health (Grants P50NS098685, P51OD011132, DP2MH113095-01, EY017292, 1R01DA029639, 1R01NS067199, R21EY024362, R01EY019258, R01EY023277, R01EY011378, P51OD010425, and P30 EY01730), University of Pittsburgh Brain Institute (Start-Up funds to W.R.S. ); the National Science Foundation (Graduate Research Fellowship Program to L.A.); National Defense Science and Engineering Graduate Fellowships (to L.A.); the Friends of McGovern Institute (to L.A.); the Japan Science and Technology Agency (PRESTO Grant JPMJPR1683, to K.I. ); KAKENHI (Grants 15H05879 and 17H05565, to K.I. ); the Howard Hughes Medical Institute; the Life Sciences Research Foundation; the German Research Foundation (DFG Emmy Noether SCHM2806 to M.C.S. ); and European Research Council (Optovision, to M.C.S.). We thank all those in our respective laboratories and our collaborators that contributed data and resources to the studies discussed in this review; our colleagues for constructive comments and discussions to parts of this manuscript, including Edward Boyden and Robert Desimone (L.A.), Gregory Horwitz (Y.E.S. ), Masahiko Takada (K.I. ), and Carsten Klein, Michael Ortiz-Rios, Beshoy Agayby, and Marcus Haag (M.C.S. ); and Amber Torrise for developing the artwork in Figures 1 and 2. (2017) Advances in optogenetic and chemogenetic methods to study brain circuits in non-human primates. J Neural Transm (Vienna), in press. (2015) Potential of optogenetics for the behavior manipulation of non-human primates. In: Optogenetics: light-sensing proteins and their applications (Yawo H, Kandori H, Koizumi A, eds), pp 279–290. Tokyo: Springer Japan.